Still up north. Still fishing, taking photos and filming, trying to squeeze as much blog material as possible out of the way-too-short subarctic summer. I´ve had some really good fishing sessions during the last weeks, catching several good fish and even a couple of big ones on the dry fly. 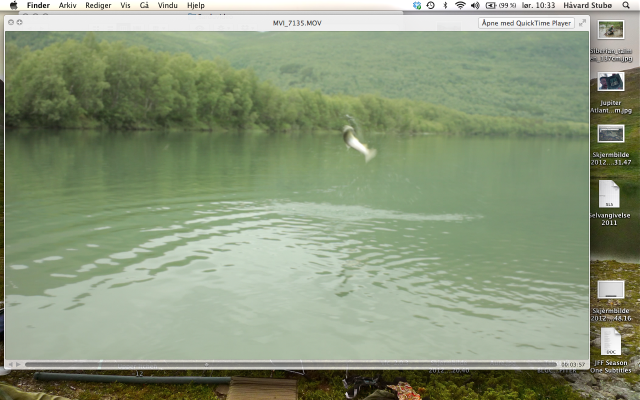 The high-jumping trout on the video screenshot above was caught during a good mayfly hatch in one of my favorite rivers. The camera was rolling on a tripod behind me, and as an added bonus, Gisle Helgesen, trout fisherman par excellence, arrived just as I hooked up with the fish. He filmed a little bit of the fight, and afterwards we had a great fishing session, catching a couple of good ones on camera. So stay tuned for new videos. Another expedition coming up in a couple of days – I´m going for big trout in a remote wilderness river somewhere above the arctic circle. I´ll keep you posted! Lucky you, Håvard. Great to hear somebody is catching. I also looked your season one dvd. Loved it. But could you guys make a film (short) of all those days and trips you didn’t catch. With your style of filming it could be a hit.Or are there any of those days? We could probably make 100 films of people not catching fish… But thinking about this gave me an idea for a short edit for the web. Thanks! Lovely! Can’t wait to see the new material!